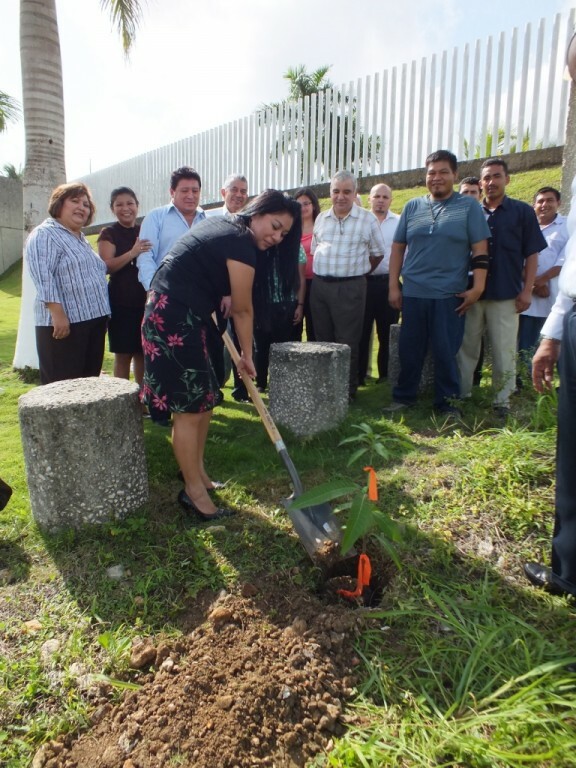 Press Release - Mexican Embassy to Belize - July 17 2011 - As part of the celebrations for the International Year of Forests and the National Reforestation Day, the Embassy of Mexico in Belize, planted 3 trees at the Embassy’s premises in Belmopan. The ceremony was part of the 2011 International Year of Forests declared by the United Nations General Assembly and the National Tree Day commemorated in Mexico on the second Thursday of July. In Mexico, during the National Reforestation Day on July 17th over 100 thousand Mexicans participated at 360 sites across the country and planted trees over 11,300 acres. One of the objectives of the National Reforestation Day in Mexico and its celebration at the Mexican Embassy in Belize is to raise awareness and active participation on sustainable management, conservation and sustainable development of all types of forests. Efforts currently made in Mexico to combat deforestation have also been recognized by the United Nations Environment Programme (UNEP). Mexico is one of the five countries with the highest reforestation rate in the world. From 2005 to 2010, Mexico reduced its average deforestation rate to less than half.